Stylish and efficient cooking are easy to achieve with this remarkable mid-sized microwave oven by Danby. This model offers a generous 1.1 cubic feet of interior cooking and heating area with a maximum power output of 1000 watts. It features a fashionable and durable stainless-steel interior and exterior which allows it to easily assimilate with any type of existing décor. The unit comes with numerous cooking options as it offers 10 different power levels to choose from. There are six separate one-touch cooking settings for popular foods such as frozen dinners, popcorn, and pizza as well as speed-defrost, cook-by-weight, and defrost-by-weight specialty programs. The state-of-the-art electronic controls are a breeze to program and monitor via the easy-to-read LED timer and clock unit. 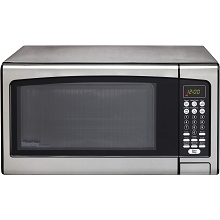 This high-quality microwave oven also comes with an 18-month warranty on parts and labor. 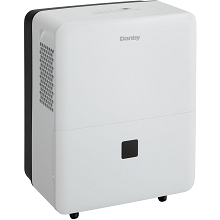 Improve the comfort level of your home with Danby's 50-pint portable dehumidifier. This energy efficient unit operates quietly on 2 fan speeds (high/low) in rooms up to 3,000 square feet. It has a smart dehumidifying function that allows the unit to automatically control humidity by factoring in ambient room temperature. If the unit shuts off unexpectedly due to a power outage, it will automatically restart with the previous function settings when power is restored. The automatic de-icing system ensures the coils are always ice-free while the low temperature feature allows the system to continue to operate at temperatures as low as 41ºF. Maintenance is easy with the removable air filter and direct-drain system. Plus, Danby's 50-pint dehumidifier has four built-in caster wheels making it easy and convenient to move the unit from one room to another. 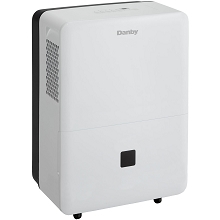 Improve the comfort level of your home with Danby's 60-pint portable dehumidifier. This energy efficient unit operates quietly on 2 fan speeds (high/low) in rooms up to 4,000 square feet. It has a smart dehumidifying function that allows the unit to automatically control humidity by factoring in ambient room temperature. If the unit shuts off unexpectedly due to a power outage, it will automatically restart with the previous function settings when power is restored. The automatic de-icing system ensures the coils are always ice-free while the low temperature feature allows the system to continue to operate at temperatures as low as 41ºF. Maintenance is easy with the removable air filter and direct-drain system. Plus, Danby's 60-pint dehumidifier has four built-in caster wheels making it easy and convenient to move the unit from one room to another. Improve the comfort level of your home with Danby's 45-pint portable dehumidifier. This energy efficient unit operates quietly on 2 fan speeds (high/low) in rooms up to 2,500 square feet. It has a smart dehumidifying function that allows the unit to automatically control humidity by factoring in ambient room temperature. If the unit shuts off unexpectedly due to a power outage, it will automatically restart with the previous function settings when power is restored. The automatic de-icing system ensures the coils are always ice-free while the low temperature feature allows the system to continue to operate at temperatures as low as 41ºF. Maintenance is easy with the removable air filter and direct-drain system. 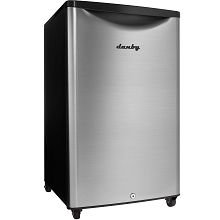 Plus, Danby's 45-pint dehumidifier has four built-in caster wheels making it easy and convenient to move the unit from one room to another.